Mushi-uta's story takes place in the near future. Ten years before the story's opening, strange insect-like creatures known as "Mushi" began appearing. The Mushi are able to consume peoples' dreams and thoughts in return for supernatural powers. At the end of episode one, protagonist Daisuke "Kakkou" Kusuriya encounters a young girl named Shiika Anmoto. The two, in time, become quite close. However, unbeknownst to Kakkou, Shiika is an escapee from a secret prison known as GARDEN where those posessed by the Mushi, known as the Mushitsuki are held. GARDEN's military force, the Special Environmental Conservation Executive Office, dispatches its finest killer to track down Shiika. However, they are faced with resistance from the Mushibane resistance organisation, led by the secretive "Ladybird." Since someone else made a very negative review about this series, I decided to give you another look on the situation. Mushi-uta's story takes place in the near future. Ten years before the story's opening, strange insect-like creatures known as &quot;Mushi&quot; began appearing. The Mushi are able to consume peoples' dreams and thoughts in return for supernatural powers. At the end of episode one, protagonist Daisuke &quot;Kakkou&quot; Kusuriya encounters a young girl named Shiika Anmoto. The two, in time, become quite close. However, unbeknownst to Kakkou, Shiika is an escapee from a secret prison known as GARDEN where those posessed by the Mushi, known as the Mushitsuki are held. GARDEN's military force, the Special Environmental Conservation Executive Office, dispatches its finest killer to track down Shiika. However, they are faced with resistance from the Mushibane resistance organisation, led by the secretive &quot;Ladybird&quot;. First, Mushi-uta didn't attract me at all, since I really hate bugs. But this is so much more than only bugs! The Story resembles around the normal high-school boy, Daisuke Kusuriya. He is, in reality, known as ''Kakkou'', who works for an orginization that kills other people's ''Mushi''. He meets both Shiika and Rina, Rina also known as ''Ladybird'' is the leader from the resistance against the orginazation where Daisuke works for. Shiika has a very rare Mushi, so she's known as ''Fuyuhotaru''. She is the only one who escapted from GARDEN after her Mushi got killed by Kakkou (Daisuke). After watching some episodes, I really got addicted to Mushi-Uta. While watching it, I had a good feeling about this series and that turned out to be right. This has alot of tragedy but it's really worth watching. I don't have objections about the animation. The characterdesigns are well done and I didn't saw alot of mistakes. I think it's very nice made and wouldn't want it any other way. Well, let's start with the opening and ending music. The name of the opening song is ''Mushi-Uta'' (how original) sung by Akatsuki, which was a very good song. I didn't mind hearing it every episode at all. Then, the ending song, ''Sayonara'', sung by Hiromi Sato was really a big +! I loved it and even now I can't get enough of it. When the moment for some background-music came, they gave it to us and I've also heard enough sound-effects to make this come out to a 9. The good thing about this is, that you won't only get to know the main characters. I also learned some things about the supporting characters, so you'll also get to know them! I really loved everyone in Mushi-Uta except Kakkou's boss. I loved Daisuke very much, because how he looks on the outside turns out to be very, very different from the inside! He was kinda mysterious but did seem to have a soft spot for Shiika. It also looks like ''Daisuke'' and ''Kakkou'' are two different persons, if you didn't knew that Daisuke was Kakkou, I don't know if I would've known that they are the same person. He's different from the usual male lead's, so I really liked him. Than, Shiika, my personal favourite character. Even though she might look like the normal ''sweet'', ''shy'' girl, for me, she was different. I liked having a girl like her who doesn't seem to hurt anyone have such a great power as she has. Without her, it wouldn't be the same! Last, Rina, who's in the same class as Daisuke. Think everyone of us will know her type of person, the big-mouthed girl at school, and yes, outside the school, she's ''Ladybird''. Ladybird is the leader of the resistance who falls in love with Daisuke! As I said, she falls in love with Daisuke without knowing that he's Kakkou, her enemy. I also loved her personality and how she tries to do the best thing. Even though Daisuke does not seem to love her, he really did like her. 10! Yeah, I really enjoyed everything of this. No episode bored me even through you must watch until the end if you want to understand everything. The plot might seem a bit confusing, but the confusing thing might end up being Mushi-Uta's charm, as for me. Anyway, overall, this anime wins! It will remain as one of my favourite animes ever and I can't wait for season two (yes, there's going to be a season two!). I hope that you guys will give it a chance and hopefully enjoy it as much as I did! Before I start naming the 'buts', let me tell you what really intrigued me with Mushi Uta; the things that really had this series going for me. For one, the animation. It's a 12 episodes long show, which is really short considering the amount of storytelling needing to be done. However, unlike many 12 episodes having Anime's, the animation quality wasn't bad and in fact one of this Anime's strong points. Action scenes were worked out nicely, coloring was nice and fitting, the animation was smooth and the backgrounds and effects looked particularly interesting enough. Besides animation, the sounds are well done (though not exceptional) and the whole concept lurking behind this Anime is extremely good. To be honest, without knowing anything about this Anime I had a peek into the first episode. I ended up finishing it and a curious mini me inside me was triggered into watching more and more. The idea itself was great, the characters seemed perfect and the concept seemed worth it. Worth time that is. More about the characters before I start ranting on and on about the concept. The visuals (designs) are, just like the animation, pretty good. It's not exceptional or really interesting; but it fits in with the story that's being told and therefore is pretty likeable. Especially likeable is the main character who seems like the perfect 'badass'. He wears goggles, is an assassin and besides that, is the strongest guy around! I mean, no more wimps as lead characters, finally a strong guy! At least, so I thought. However, let me get back to the concepts. The concept was great, the characters had potential. Then where did it go wrong? Wrong you say? Yes, because somewhere in time Mushi Uta lost my interest -and besides that- wrongfully used the potential I saw in it that much earlier. Let me clarify. For starters, the 'badass' main character was put into 'development', a forced development by that. The creators figured it was his time to develop; thus they made him develop. It was so wrong! All of a sudden Mr. Perfect Assassin turned into a wimp! It's cool and all if he starts getting emotions, but why did he turn weak again? Why did he get ill? And I'm not trying to spoil things here, but he really did turn weaker towards the middle/end. Which is a shame. Besides that, there is a love triangle going on which -in my honest opinion- isn't adding anything to the story. It's like making a mixture of coke light and coke. I mean, what's the point really? Of course the concept isn't consisting of just one character. But it's consisting of it's story and how the story develops (alongside it's characters). Things seemed rushed towards the middle/end. Even an unneeded addition of a love story was added. What the f, this is an action packed fantasy story, and you are adding a love triangle. Wake up call please? Besides that the story gained an uninteresting plot twist. The idea of bugs (where the story is about) turned chaotic and plain weird as the story progressed. Unnecessary scenes were inserted and more than once have I been tempted to just 'STOP' the player and start doing something that I do like. For that reason, just the feeling of wanting to 'STOP' something -despite being well animated- is more than enough reason for me to tell you to warn you. It's not that bad an Anime really, heck you might even like it. But for me, it's a 12 episodes long Anime that needed more episodes, a renewal of it's complete story and it seems like I wasted time watching 51 episodes of something unenjoyable while it's only 12 episodes long. To me, it's not worth more than a 6. But seeing how crappy some Anime I rated a 6 are, and seeing how it did have loads of potential (especially earlier episodes)... I'm giving it a 7. The genres are mostly action/drama, in a fantasy world setting. It's 12 episodes long. Most enjoyment I had with this was from it's first episode; after learning about it's concept. Least enjoyment I had with this Anime was probably in one of the middle episodes or ending episode. This anime is a prime example of bad storytelling. There are people called &quot;hosts&quot; who can summon powerful insects to fight battles for them. If you kill a host's insect, the host goes into an incurable comatose-like state called &quot;fallen&quot;. 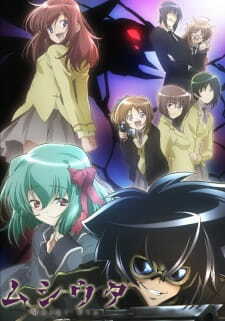 News of a host who was able to recover from the &quot;fallen&quot; spreads, and two groups race to capture her to learn her secrets. It had the makings of an action-packed drama; unfortunately, it was presented quite poorly. Most of the anime was focused on a love triangle that was only borderline interesting. One of the characters that had the most screen time was also the least interesting character in the whole show. The love story didn't fit well with the action scenes. The plot progression was confusing. If only they had explained the general basis for mushi in a more straightforward manner it would've been more enjoyable. Instead, almost every important detail was left a mystery to be revealed in a future episode, which left me asking, &quot;huh?&quot; during most of the episodes. Almost every 24-minute episode felt like an hour. This series could've been so good had it been done right. Welp, when I first started watching this show, I was like, "Oh cool! Bugs! That's awesome and original," but then, after watching past the second episode, I couldn't shake the impression that the bug aspect was really all this show had going for it. After finishing the show, I was sadly proven correct. But, let's break it down, shall we? Okay, as has been pointed out by two of the other reviewers, the story is incredibly confusing and convoluted. There are so many plot holes in it and unanswered questions that it's like falling down a trapdoor, hitting twenty some odd tree branches, and then proceeding into a large, black abyss of death and despair... Okay, so that might be a bit of an overreaction, but seriously, the story almost seems more like an afterthought than the purpose. Here's an example of one of the many problems: Right from the get go we know that the main character Kakkou has destroyed the Mushi of one of the other main characters, Shiika. We see this within the first five minutes of the first episode. This acts as an interesting lead into the series, and does get the viewers hooked as the setting is uncertain and the context is unclear. Who are Shiika and Kakkou? And why did Kakkou destroy Shiika's Mushi? Unfortunately, the entire story is revealed in its entirety to the viewer... in, I believe, episode three. So all the mystery surrounding the story setup is gone very early on. Also, we see that the two know each other, yet, when Kakkou and Shiika meet later in episode one or two, they somehow have no idea who the other person is. What? How does that make sense? We know that Kakkou remembers the girl from the opening, who looks EXACTLY the same as Shiika, yet, he has no clue the two are one and the same? Yes, Kakkou suffers from what I like to refer to as "Sailor Moon Syndrome." Oh, no! She's wearing a different outfit! I can't tell who this strange person I've surely never met before is! Even though she's the only person in the whole anime and probably all of Japan who has that hair color and style! At least Shiika has an excuse as she suffers largely from amnesia... which is something we aren't told until practically the end of the series. Would have been nice to have know that sooner. Also, her amnesia seems to be highly selective as she can still remember her family and goes home in an attempt to find them. Sadly, they are gone. Where? No one knows and the subject is never revisited. Maybe they all moved to Tahiti. It just gets worse from there. Kakkou goes to school under the name Daisuke Kusuriya, allegedly to track down the head of the resistance, Ladybird. I could have sworn with the way that this was presented that they already knew who Ladybird was, otherwise, why else have Kakkou enroll in a specific school in a specific class? Yet, later on, it seems like they had no idea who Ladybird was.. or they just decided not to attack her. Why? Who the heck knows? Maybe they just knew that she was high school age and pulled the name of a high school out of a hat in the hopes that it would be the one she attends and happened to get lucky. Or they asked their magic eight ball for guidance. Yeah. That must be it. Also, the resistance in and of itself doesn't make sense. It's only made up of four people, two of which are small children. Now, they imply that it was marginally bigger at some point, but I'm left thinking, "If this is the biggest threat to the SEPB (Kakkou's organization), how sad are they?" Further, Shiika manages to rescue everyone from a very dramatic situation, but we never actually get to see how. They're all stuck, with seemingly no hope, then bam! Next episode. Everyone's safe and happy thanks to Shiika. But do they show us how or even explain it? Nooooo. Really, it's just a huge tangle of a bunch of very vague ideas that are presented poorly and hastily. To be fair, the series starts off with interesting story elements, like the Mushi, but its lack of proper explanation overshadows any enjoyment to be had from them. I personally wanted to know more about Keji's past and situation, as its briefly touched upon (oddly inappropriately as he just starts blathering on about his past to Kakkou at one point for no apparent reason), but that is never fully explored either. The art was fine. Some shots during the action were a bit shoddy and they make Keji's chin oddly elongated at points, but it was pretty nice for the most part. Eh, the opening theme was okay. It was a bit slower and dreamy with the stereotypical "hope and love conquers all" theme. I watched it once or twice, then skipped it for the rest of the series. The ending I suffered through once. It was also slow and meh. Better than the opening but without the intriguing animation to warrant me watching it. The sound effects were okay and the voice acting was pretty good. The screaming was especially well done, I'll grant that. So, overall, I really didn't much care for the series. It really bored the heck outta me, to be honest, which is why I rated it so low. Even with all the story issues, it would have gotten a 5 out of me had the pacing not been so terrible. Even the action scenes were aggravating because they were constantly broken up with dramatic introspections and overly dramatic dialogue. I will give the ending some credit as it did some things that were unexpected, but for a series that placed so much emphasis on the ending, it failed to deliver. I found myself not caring about any of the characters aside from Keji and his assistant, and even then, I didn't grow too attached as they remained largely underdeveloped. If the show had been limited to 6 episodes and they'd focused more on the plot and ironing out the story, it would have been decent, possibly even really good. Alas, it was not so. With how many great anime there are out there, I recommend not wasting your life and time on this one.